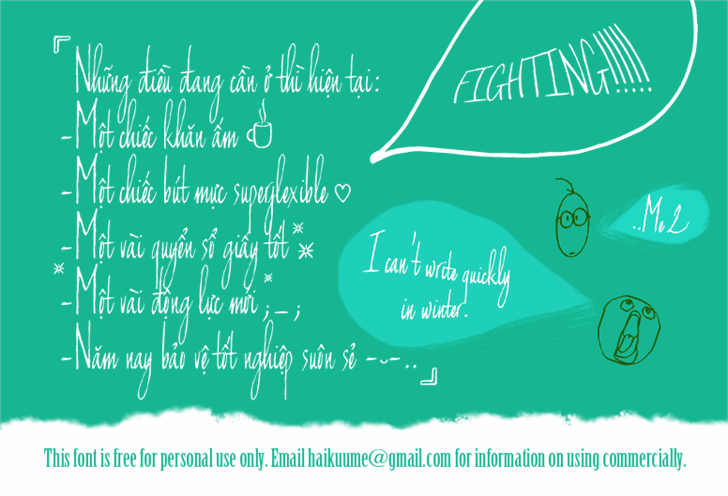 -"Can't write quickly in winter" FEATURES EXTENSIVE LANGUAGE SUPPORT >:D< It contains 504 characters. - My fonts are free for personal only. Nobody can claim ownership, sell, or use my fonts to make derivative fonts. 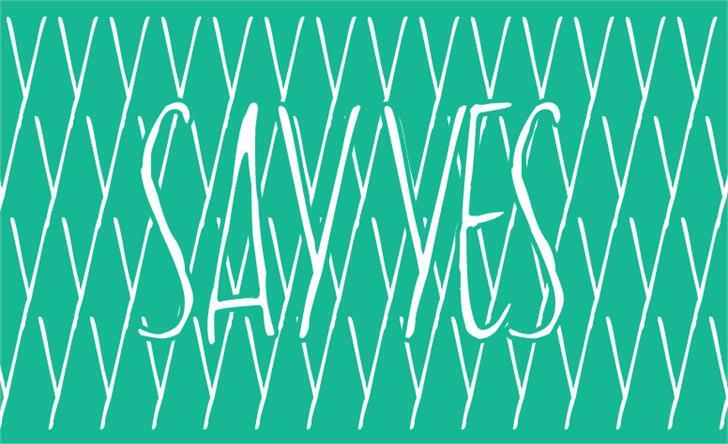 Please DO NOT transform/ alter any font of mine then sell your alterations. They are not made for these purposes. 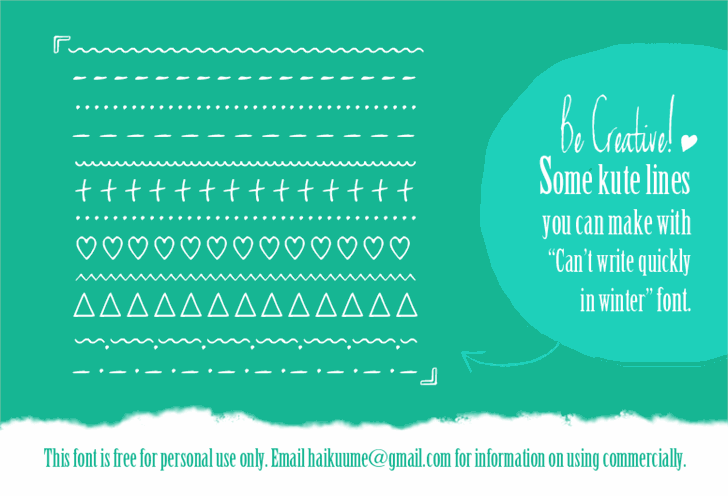 - For any commercial purpose please contact me at: Haikuume@gmail.com to purchase license(s) from me. Can't write quickly in winter (Haiku Blue) © Poemhaiku. 2013. All Rights Reserved. - Can't write quickly in winter Font Agreement - <br> <br>- Installation and Use: You may install and use this font on your computer and use it in non-commercial projects. <br>- Reproduction and Distribution: You may not reproduce and distribute any copies of the SOFTWARE PRODUCT. <br>- Restrictions on Alteration: You may not rename, edit or create any derivative works from the SOFTWARE PRODUCT. 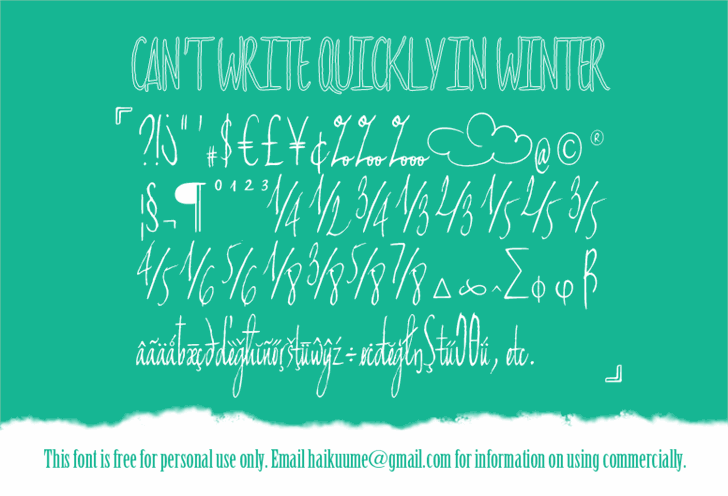 <br> <br>Can't write quickly in winter Font is free for personal use only. <br>If you want to use this font for commercial use, including non-profit, please use contact: haikuume@gmail.com to purchase a license from me.